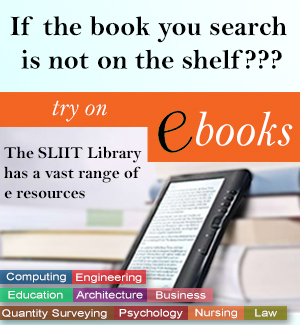 To support and advance the educational mission of the SLIIT by facilitating access to scholarly collections and information resources. SLIIT Malabe Campus,New Kandy Road,Malabe. Opening Hours 7.30 am to 7.00 pm. # 28, St Michael’s Road, Colombo 03. Opening Hours 8.00 am to 6.00 pm. Opening Hours 8.30 am to 5.00 pm. * Library is closed on Poya days and other special holidays indicated in the SLIIT Calendar.